Are you tired of the endless paper charts which your office needs to maintain? Are you worried about the safety of the paper charts you are responsible for? 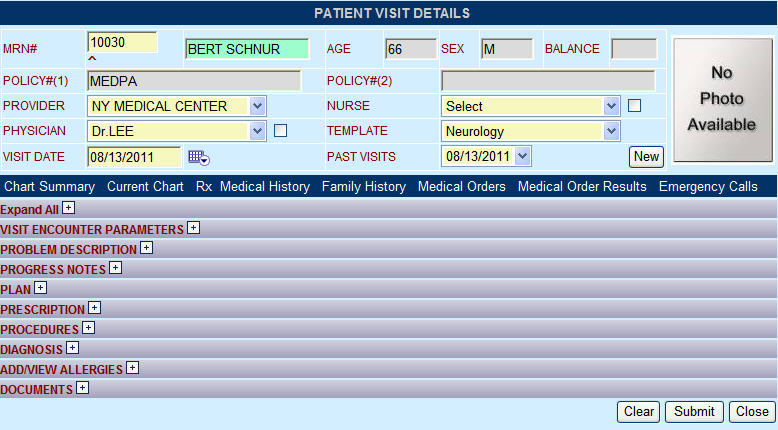 Techdoc © Patient Chart allows you to complete the patient visit notes in minutes through the use of predefined template. TechDoc Patient Chart Module allows the physician and the nurse to record Visit Encounter Parameters, Problems, Treatments, Subjective Notes, Objectives Notes, Allergies, Medication, Procedures Performed, Diagnosis Codes and Plan for next visit.The Patient Chart also allows you to scan your existing paper based charts and convert them into digitized format. You can get rid of your paper charts completely! The Patient Chart is secure / encrypted / audited based on the latest industry standards that you never have to worry about unauthorized access of your patient charts. Techdoc© Patient Chart is an easy to use comprehensive tool which is all you need to document the patient visit. The Patient Chart templates are specific to your specialty and it takes minutes to customize the templates to your practice needs. The templates even allow you to define your standard notes for various conditions which can then be reused and hence eliminating the need to type in front of your patient. Visit Encounter Parameters: Allows you to record Vital Stats such as Height, Weight, BMI and any other parameters which you would like to capture for your patient. Problem Description: Allows you to record the patient problem and physician observation of the problem. Objective Notes: Allows you to record objective notes on predefined categories. Subject Notes: Allows you to record detailed notes on the problem diagnosis and treatment. Plan: Allows you to enter the treatment plan for the visit. eRx: Allows you to prescribe medication electronically using our Surescripts© certified ePrescription module. Medical Orders: Allows you to order external referrals such as Labs and Specialist Referrals. Medical Results: Allows you to capture/scan Medical Order results into the patient chart. Medical Questionnaire: Allows you to record response from the patient for a predefined questionnaire. The Medical Questionnaire can be customized to your needs with an easy to use tool. Reminders: Allows you to setup reminders for yourself as well as other staff in the practice. Patient Emergency Calls: Allows you view any calls made by the patient to your office with regards to a medical problem.